Home Costs > How Much Does an Acre of Land Cost? If you want to invest in real estate, specifically a parcel of land, there are prior considerations you should take concerning your budget and the knowledge of the cost per acre. The geographical location is key with real estate. An acre of land can cost as little as a few dollars to as much as a few million dollars. The pricing is very hard to pinpoint unless you know exactly where you want to search. Msn.com said New Jersey has the highest average at about $196,400 per acre. 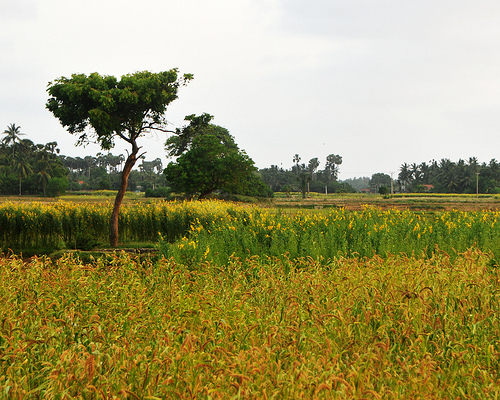 Farmland, for example, can be between $5,000 to $8,000 per acre. There can be cheaper land in some locations with an average cost of around $1,000-$5,000 per acre, and these are areas that have no timber or structures. In 2015, the average acre in the United States sold for $3,020. 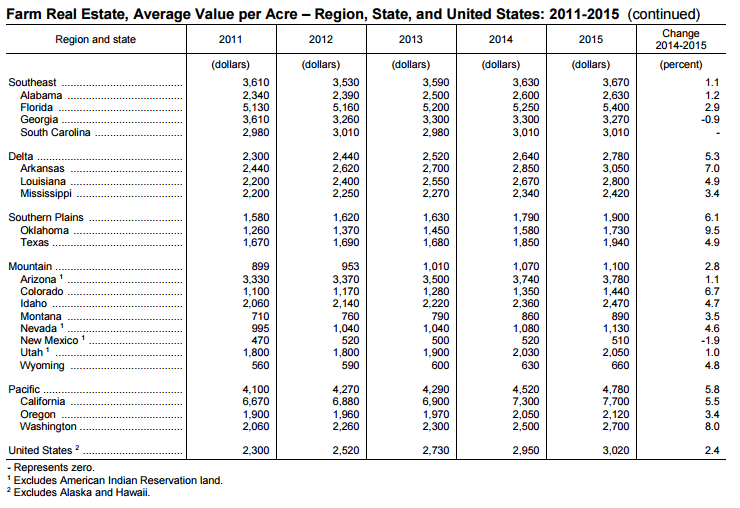 The highest farm values were in the Corn Belt region, where land sold for $6,350 per acre. Land with timber may vary according to the age of the timber. This will cost about $3,000 per acre. As for residential, land in largely undeveloped areas will be significantly less than land in highly developed areas were roads, housing and other structures are readily available. Land appropriate for commercial building construction may sell at $10,000 an acre or even more, again, depending on the location. According to this HouseRepairTalk.com forum thread, forum members stated that an acre of land in Nebraska can cost $8,000 per acre while an acre in Texas can cost upwards of $6,000. The website LandWatch.com is a classified website that allows you to browse state and international properties. On this website, you can search by city, the number of acres you want, the prices you’re willing to pay, and you can get a general idea of what it may cost. The prices below are acreage prices by state. Remember, this is an average. This is based on farmland only via a USDA land value report. Take this information with a grain of salt because you will find that all land spread across the United States within these states will vary a lot. 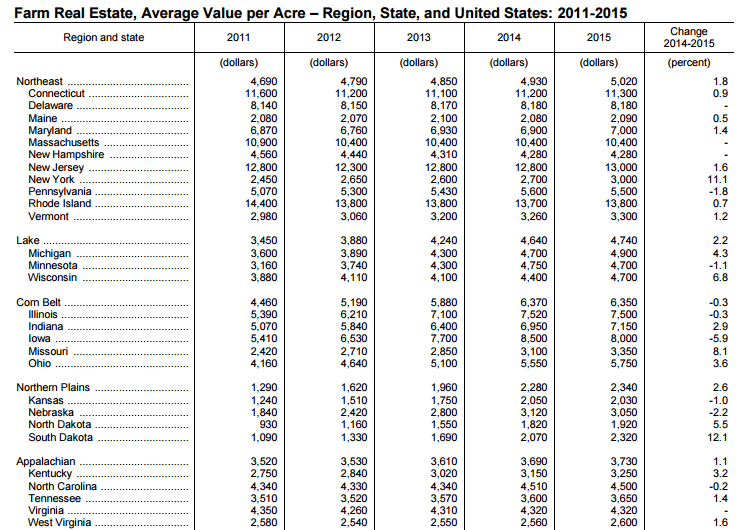 The USDA created a report showing us the average farm related value per acre. This information is from 2011-2016. We all know that the geographical location is key in terms of real estate. Land located in a high crime area will cost a lot less than land in an area high in demand such as Hawaii. Generally, the more acres you purchase, the more you can save. This isn’t always the case, though. Again, this is going to widely depend on where the land is located. There are a few different types of land available. Popular types can include hunting, timberland, waterfront, farms, home sites and international. When you buy land, the timber, structures, and other developments are included unless stated differently in the purchasing contract. Included in the price will be the recording deeds, mapping, regulatory permits, and other various paperwork related to the state you purchased the land in. However, this depends on the seller and the buyer-seller agreements. How big is an acre of land? Approximately 43,560 square feet. Property tax is one of the extra costs to consider. Surveying may be included in the price or sometimes the buyer will have to add this as an extra cost. A surveyor may also be needed before you purchase the land to test the soil. Make sure you consider the cost of developing the land if this is your intention. Building a home will obviously be an additional cost, but remember that all cities will more than likely require permits and approval before you build the home. The cost of clearing land per acre can be anywhere from as little as $100 per acre with little vegetation to as much as $6,000 per acre with a lot filled with hundreds of mature trees. While it’s common to purchase land with cash, a lender appraisal will be necessary if you want to secure a land loan. Check the utilities before buying the land, especially if you plan on building on the lot. Sometimes water rights won’t run with the land, and this means you won’t be able to dig a well. Check the water table and determine the difficulty of digging. Aside from water, what utilities are nearby? Can you get cable services? What about electricity? If there’s no sewer available, what would a septic system cost? If you can only access your land by going through an adjoining parcel, it’s important to have an easement recorded. You will want to find out who maintains the road and what your neighbors have to do to access their land. It’s always wise to obtain title insurance. Pay close attention to the elevation, especially if building on a side of a cliff or near water. If you were to build, are you in a flood zone? Could there be a potential landslide? Always check the zoning requirements to determine what kind of home you can build before committing to the land. The best way to save money on land purchases is by talking with a few local real estate agents. Since these agents will know the area best, they may know of some land that meets your qualifications. Don’t forget that you can negotiate on the price. Almost all real estate transactions never sell for full price. Try to look for types of land where you can save money, even if you will still incur extra costs down the road for the land developments and facilities. Usually, developed areas are priced too high, and when you compare the amount you will spend in improving the land, you will find that you can get more savings by simply buying the already developed land. Make lists of the possible expenses you may have and make comparisons; ask someone to help you figure out the best buy. Check local tax assessor records or Zillow.com to see what land has sold for in the area. By doing this, it will give you an idea of what the land may be worth. LandCentury allows you to search vacant land for less than $1,000 per acre. I inherited just under 33 acres where Campbell Rd and Day Rd intersect in Garland, ME. It is actually on Day Rd. Trying to figure out the value of the property. Purchased 10 aces in Cumberland va. With small pond and house with 685 sq feet. 155 acres bordering National Forrest, 100 year old primitive cabin, barn, year round spring.